Lynn City Hall is located at 3 City Hall Square, Lynn, MA 01901; phone: 781-598-4000. Photo: Lydia Pinkham House, ca. 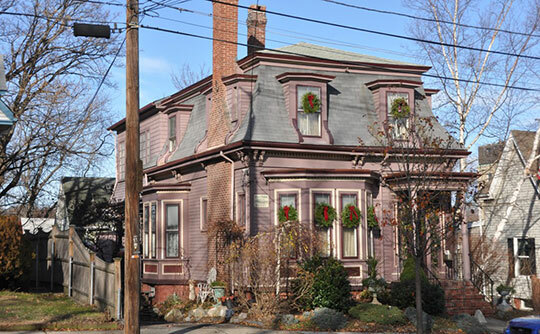 1872, 285 Western Avenue, Lynn, MA Listed on the National Register of Historic Places in 2012. Photographed by User:Magicpiano (own work), 2012, [cc-by-3.0 (creativecommons.org/licenses/by/3.0)], via Wikimedia Commons, accessed September, 2017. The area that is now the City of Lynn was first settled about 1629 and was incorporated in 1631. Lynn, first known as Saugus, was named in honor of King's Lynn in Norfolk County, England. Appropriately, Lynn to the ancient Britons signified 'Place of the Spreading Waters.' Very early the town began to swing toward industrialism. One of the first settlers was a tanner, and his establishment laid the foundation of a related industry that was to make Lynn famous throughout the industrial world. Two highly skilled shoemakers, Philip Kirtland and Edmund Bridges, settled near the tannery in 1635 and began to fashion shoes that compared favorably with those produced elsewhere. By the beginning of the eighteenth century almost every house had its 'back-yard' shop, and presently Lynn was supplying most of the footgear for Boston. John Adam Dagyr (1750), a Welsh shoemaker, set a high standard of workmanship which lasted for many years after his death. The beginning of the nineteenth century brought new life, resulting in part from the activities of Ebenezer Breed, who was influential in persuading Congress to protect the growing industry with a tariff. In 1800 the State Legislature passed an act to encourage the manufacture of shoes, boots, and 'arctics' (galoshes) . An army of craftsmen toiled early and late in their small shops, and in 1810 manufactured about one million pairs of shoes. With the introduction of the first shoe sewing machine in 1848, the factory system began to take over. The domestic production units of the craftsmen were liquidated and the workers were absorbed into huge plants. With bewilderment and resentment, they saw their craftsmen's status fade into insignificance when they took their places at the alien machines. The ensuing friction brought about the shoe strike of 1867, when all shoe factories were closed down for seven weeks. Demanding better living conditions, the employees organized parades in which several thousand men and women marched with brass bands, fire companies, military organizations, and sympathizers from neighboring towns. The new system attracted foreign workingmen by the thousand and altered the racial complexion of the city. The French-Canadians, the largest racial group, dispersed through the city. The Irish, second in numbers, were forced by religious intolerance to settle in a compact district. The third most numerous group, the Italians, as well as Greeks, Poles, and Armenians, formed distinctly bilingual communities but lost most of their picturesque color. The Greek district in the vicinity of Pleasant and Tremont Streets has several restaurants which feature native dishes, notably Turkish coffee, nutritious yoghurt, and baklava. There are five large Jewish districts where Yiddish is still widely spoken and orthodox customs are maintained. An interesting episode of the period of immigration was the sojourn of Charles Bata, a Czechoslovakian, who came here to learn the trade. Having observed factory methods, he returned to Czechoslovakia, and built one of the largest and most modern shoe factories in the world, capable of producing footgear at a very low cost, somewhat to the resentment of his industrial alma mater. Until the last decade of the nineteenth century Lynn was the leading shoe center in the country. In November, 1889, fire ravaged thirty-one acres of the business section, with a property loss of about $5,000,000. By 1915, it had fallen to third place. The introduction of modern machinery decreased the reliance on skilled craftsmen, and manufacturers began to remove into areas of cheaper, less-skilled labor. Recently, this migration seems to have halted. There has also been a recent noticeable expansion of the leather industry. In the period immediately following the Civil War, Lynn shoe workers joined the powerful Knights of St. Crispin, but this union declined. Never since has there been a long period when the principal crafts were unorganized, but the unions in the several crafts have not always cooperated well. At present most of the Lynn shoe workers belong to the United Shoe Workers of America, affiliated with the Committee for Industrial Organization. A company union in the Lion Shoe Company was recently dissolved by the National Labor Relations Board. The General Electric Company set up a system of works councils in its huge plant just after the World War. In 1934, the workers organized an industrial union, and secured recognition. This union spread to other centers, and as the United Electrical and Radio Workers is affiliated with the C.I.O. The leather workers of Lynn also belong to a C.I.O. affiliate, the National Leather Workers. The workers in a number of other trades hold charters from unions affiliated with the American Federation of Labor. Lynn's varied industries have made it possible for the city to withstand, somewhat better than single-industry communities, the tremors of economic instability. Although the shoe factories and their allied trades predominate numerically, the General Electric Company is the largest industry of the city, and in 1935 its two Lynn plants employed more workmen than any other concern in the State.